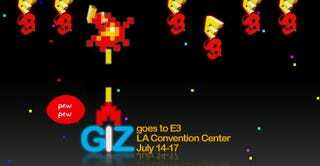 Gizmodo At E3 2008: What Do You Want To See? It's almost here. E3. The Entertainment Ere... Elephant...something to do with games. Next week from July 14 to July 17, we'll be providing live coverage of all the stuff that's going down with Microsoft, Nintendo, Sony and all the other companies exhibiting their stuff on the show floor. Will Nintendo come out with yet another $99 accessory to build a game off of? Will Sony reveal their Wiimote knockoff? Will Microsoft show their Home + Mii avatar scheme? Will Nyko come out with some crazy accessories? What do you want to see there? Tell us in the comments.